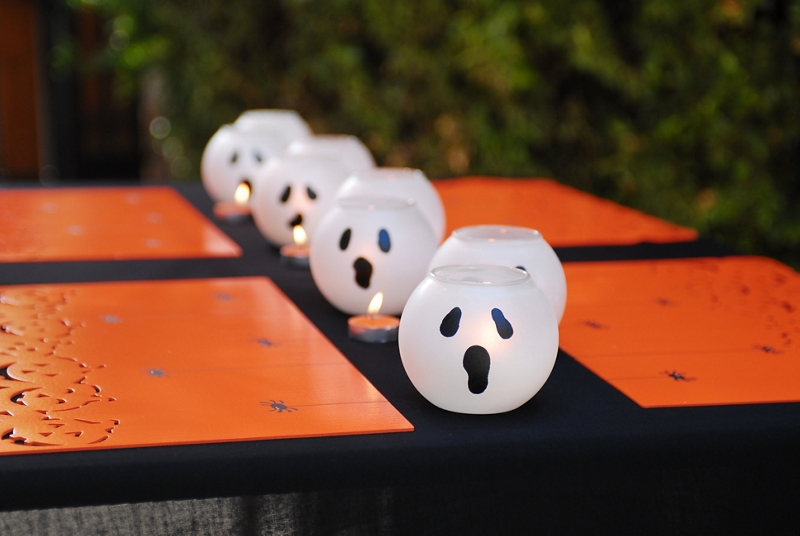 These ghostly votives add a spooktacular touch to your fall décor. Krylon® Short Cuts® Paint Pens in Gloss Black. View additional Glass spray paint projects from Krylon®. Set up a spray area by covering a table or other work surface with newspaper. It helps to place an extra smaller piece of newspaper under each individual votive that you can use to rotate the individual votive while you spray. This is particularly useful if you are unable to move around your work surface freely. Begin spraying several light coats of Krylon® Frosted Glass Finish on the lip of each votive. It is not necessary to saturate the lip as the idea is to create a "disapperating" gradation of white to add to the ghostly illusion. Let dry completely. Turn the votives upside down. Spray several light coats of Krylon® ColorMaster™ Paint + Primer in Flat White on the bottoms of the votives until the coverage is solid while concentrating on blending the white seamlessly with the frosted glass. Let dry completely. Spray entire exterior of all the vases with Krylon® Glowz® in White so that when your votives are not lit, they will still glow-in-the-dark, welcoming dusk. Let dry completely. Once fully dry, flip the votives right-side up. Finally, freehand facial features (eyes and mouths) with Krylon® Short Cuts® in Gloss Black to give each ghost a personality!